The Chicago Tribune is a daily newspaper based in Chicago, Illinois, United States, owned by Tribune Publishing. Founded in 1847, and formerly self-styled as the "World's Greatest Newspaper" (for which WGN radio and television are named), it remains the most-read daily newspaper of the Chicago metropolitan area and the Great Lakes region. It is the eighth-largest newspaper in the United States by circulation (and became the second-largest under Tribune's ownership after the Chicago Tribune's parent company purchased the Los Angeles Times). 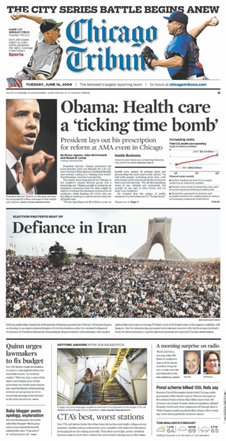 Traditionally published as a broadsheet, on January 13, 2009, the Tribune announced it would continue publishing as a broadsheet for home delivery, but would publish in tabloid format for newsstand, news box, and commuter station sales. This change, however, proved to be unpopular with readers and in August 2011, the Tribune discontinued the tabloid edition, returning to its traditional broadsheet edition through all distribution channels. The Tribune's masthead is notable for displaying the American flag, in reference to the paper's motto, "An American Paper for Americans". The motto is no longer displayed on the masthead, where it was placed below the flag. The Tribune was founded by James Kelly, John E. Wheeler, and Joseph K. C. Forrest, publishing the first edition on June 10, 1847. Numerous changes in ownership and editorship took place over the next eight years. Initially, the Tribune was not politically affiliated, but tended to support either the Whig or Free Soil parties against the Democrats in elections. By late 1853, it was frequently running xenophobic editorials that criticized foreigners and Roman Catholics. About this time it also became a strong proponent of temperance. However nativist its editorials may have been, it was not until February 10, 1855 that the Tribune formally affiliated itself with the nativist American or Know Nothing party, whose candidate Levi Boone was elected Mayor of Chicago the following month. By about 1854, part-owner Capt. J. D. Webster, later General Webster and chief of staff at the Battle of Shiloh, and Dr. Charles H. Ray of Galena, Illinois, through Horace Greeley, convinced Joseph Medill of Cleveland's Leader to become managing editor. Ray became editor-in-chief, Medill became the managing editor, and Alfred Cowles, Sr., brother of Edwin Cowles, initially was the bookkeeper. Each purchased one third of the Tribune. Under their leadership, the Tribune distanced itself from the Know Nothings, and became the main Chicago organ of the Republican Party. However, the paper continued to print anti-Catholic and anti-Irish editorials, in the wake of the massive Famine immigration from Ireland. The Tribune absorbed three other Chicago publications under the new editors: the Free West in 1855, the Democratic Press of William Bross in 1858, and the Chicago Democrat in 1861, whose editor, John Wentworth, left his position when elected as Mayor of Chicago. Between 1858 and 1860, the paper was known as the Chicago Press & Tribune. On October 25, 1860, it became the Chicago Daily Tribune. Before and during the American Civil War, the new editors strongly supported Abraham Lincoln, whom Medill helped secure the presidency in 1860, and pushed an abolitionist agenda. The paper remained a force in Republican politics for years afterwards. In 1861, the Tribune published new lyrics by William W. Patton for the song "John Brown's Body". These rivaled the lyrics published two months later by Julia Ward Howe. Medill served as mayor of Chicago for one term after the Great Chicago Fire of 1871. Under the 20th-century editorship of Colonel Robert R. McCormick, who took control in the 1920s, the paper was strongly isolationist and aligned with the Old Right in its coverage of political news and social trends. It used the motto "The American Paper for Americans". Through the 1930s to the 1950s, it excoriated the Democrats and the New Deal of Franklin D. Roosevelt, was resolutely disdainful of the British and French, and greatly enthusiastic for Chiang Kai-shek and Sen. Joseph McCarthy. When McCormick assumed the position of co-editor (with his cousin Joseph Medill Patterson) in 1910, the Tribune was the third-best-selling paper among Chicago's eight dailies, with a circulation of only 188,000. The young cousins added features such as advice columns and homegrown comic strips such as Little Orphan Annie and Moon Mullins. They promoted political "crusades", with their first success coming with the ouster of the Republican political boss of Illinois, Sen. William Lorimer. At the same time, the Tribune competed with the Hearst paper, the Chicago Examiner, in a circulation war. By 1914, the cousins succeeded in forcing out Managing Editor William Keeley. By 1918, the Examiner was forced to merge with the Chicago Herald. The newspaper sponsored a pioneering attempt at Arctic aviation in 1929, an attempted round-trip to Europe across Greenland and Iceland in a Sikorsky amphibious aircraft. But, the aircraft was destroyed by ice on July 15, 1929, near Ungava Bay at the tip of Labrador, Canada. The crew were rescued by the Canadian science ship CSS Acadia. From 1940 to 1943 the paper supplemented its comic strip offerings with The Chicago Tribune Comic Book, responding to the new success of comic books. At the same time, it launched the more successful and longer lasting The Spirit Section, which was also an attempt by newspapers to compete with the new medium. During the McCormick years, the Tribune was a champion of modified spelling for simplicity (such as spelling "although" as "altho"). McCormick, a vigorous campaigner for the Republican Party, died in 1955, just four days before Democratic boss Richard J. Daley was elected mayor for the first time. One of the great scoops in Tribune history came when it obtained the text of the Treaty of Versailles in June 1919. Another was its revelation of United States war plans on the eve of the Pearl Harbor attack. The Tribune's June 7, 1942, front page announcement that the United States had broken Japan's naval code was the revelation by the paper of a closely guarded military secret. The story revealing that Americans broke the enemy naval codes was not cleared by censors, and had US President Franklin D. Roosevelt so enraged that he considered shutting down the Tribune. The paper is well known for a mistake it made during the 1948 presidential election. At that time, much of its composing room staff was on strike. The early returns led editors to believe (along with many in the country) that the Republican candidate Thomas Dewey would win. An early edition of the next day's paper carried the headline "Dewey Defeats Truman", turning the paper into a collector's item. 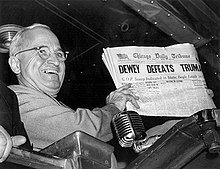 Democrat Harry S. Truman won and proudly brandished the newspaper in a famous picture taken at St. Louis Union Station. Beneath the headline was a false article, written by Arthur Sears Henning, which purported to describe West Coast results although written before East Coast election returns were available. Colonel McCormick prevented the Tribune for years from participating in the Pulitzer Prize competition. But it has won 25 of the awards over the years, including many for editorial writing. The Tribune won its first post-McCormick Pulitzer in 1961, when Carey Orr won the award for editorial cartooning. Reporter George Bliss won a Pulitzer the following year for reporting, and reporter Bill Jones another in 1971 for reporting. A reporting team won the award in 1973, followed by reporter William Mullen and photographer Ovie Carter, who won a Pulitzer for international reporting in 1975. A local reporting team won the award in 1976, and architecture critic Paul Gapp won a Pulitzer in 1979. In 1969, under the leadership of publisher Harold Grumhaus and editor Clayton Kirkpatrick (1915–2004), the Tribune's began reporting from a wider viewpoint. The paper retained its Republican and conservative perspective in its editorials, but it began to publish perspectives in wider commentary that represented a spectrum of diverse opinions, while its news reporting no longer had the conservative slant it had in the McCormick years. A week later, after studying the transcripts, the paper's editorial board observed that "the high dedication to grand principles that Americans have a right to expect from a President is missing from the transcript record." The Tribune's editors concluded that "nobody of sound mind can read [the transcripts] and continue to think that Mr. Nixon has upheld the standards and dignity of the Presidency," and called for Nixon's resignation. The Tribune call for Nixon to resign made news, reflecting not only the change in the type of conservatism practiced by the paper, but as a watershed event in terms of Nixon's hopes for survival in office. The White House reportedly perceived the Tribune's editorial as a loss of a long-time supporter and as a blow to Nixon's hopes to weather the scandal. On December 7, 1975, Kirkpatrick announced in a column on the editorial page that Rick Soll, a "young and talented columnist" for the paper, whose work had "won a following among many Tribune readers over the last two years", had resigned from the paper. He had acknowledged that a November 23, 1975 column he wrote contained verbatim passages written by another columnist in 1967 and later published in a collection. Kirkpatrick did not identify the columnist. The passages in question, Kirkpatrick wrote, were from a notebook where Soll regularly entered words, phrases and bits of conversation which he had wished to remember. The paper initially suspended Soll for a month without pay. Kirkpatrick wrote that further evidence was revealed came out that another of Soll's columns contained information which he knew was false. At that point, Tribune editors decided to accept the resignation offered by Soll when the internal investigation began. After leaving, Soll married Pam Zekman, a Chicago newspaper (and future TV) reporter. He worked for the short-lived Chicago Times magazine in the late 1980s. In March 1978, the Tribune announced that it hired columnist Bob Greene from the Chicago Sun-Times. Kirkpatrick stepped down as editor in 1979 and was succeeded by Maxwell McCrohon (1928–2004), who served as editor until 1981. He was transitioned to a corporate position. McCrohon held the corporate position until 1983, when he left to become editor-in-chief of the United Press International. James Squires served as the paper's editor from July 1981 until December 1989. In 1986, the Tribune announced that celebrated film critic Gene Siskel, the Tribune's best-known writer, was no longer the paper's film critic, and that his position with the paper had shifted from being that of a full-time film critic to that of a freelance contract writer who was to write about the film industry for the Sunday paper and also provide capsule film reviews for the paper's entertainment sections. The demotion occurred after Siskel and longtime Chicago film critic colleague Roger Ebert decided to shift the production of their weekly movie-review show—then known as At the Movies with Gene Siskel and Roger Ebert and later known as Siskel & Ebert & The Movies—from Tribune Entertainment to The Walt Disney Company's Buena Vista Television unit. "He has done a great job for us," editor James Squires said at the time. "It's a question of how much a person can do physically. We think you need to be a newspaper person first, and Gene Siskel has always tried to do that. But there comes a point when a career is so big that you can't do that." Siskel declined to comment on the new arrangement, but Ebert publicly criticized Siskel's Tribune bosses for punishing Siskel for taking their television program to a company other than Tribune Entertainment. Siskel remained in that freelance position until his death in 1999. He was replaced as film critic by Dave Kehr. In February 1988, Tribune foreign correspondent Jonathan Broder resigned after a February 22, 1988 Tribune article written by Broder contained a number of sentences and phrases taken, without attribution, from a column written by another writer, Joel Greenberg, that had been published 10 days earlier in the Jerusalem Post. In April 1994, the Tribune's new television critic, Ken Parish Perkins, wrote an article about then-WFLD morning news anchor Bob Sirott in which Perkins quoted Sirott as making a statement that Sirott later denied making. Sirott criticized Perkins on the air, and the Tribune later printed a correction acknowledging that Sirott had never made that statement. Eight months later, Perkins stepped down as TV critic, and he left the paper shortly thereafter. The Tribune has been a leader on the Internet, acquiring 10 percent of America Online in the early 1990s, then launching such web sites as Chicagotribune.com (1995), Metromix.com (1996), ChicagoSports.com (1999), ChicagoBreakingNews.com (2008), and ChicagoNow (2009). In 2002, the paper launched a tabloid edition targeted at 18- to 34-year-olds known as RedEye. In July 2000, Tribune outdoors columnist John Husar, who had written about his need for a new liver transplant, died at age 63 just over a week after receiving part of a new liver from a live donor. The Howard County Times was named 2010 Newspaper of the Year by the Suburban Newspaper Association. The Tribune won five Pulitzer prizes in the first decade of the 21st century. Salopek won his second Pulitzer for the Tribune in 2001 for international reporting, and that same year an explanatory reporting team—lead writers of which were Louise Kiernan, Jon Hilkevitch, Laurie Cohen, Robert Manor, Andrew Martin, John Schmeltzer, Alex Rodriguez and Andrew Zajac—won the honor for a profile of the chaotic U.S. air traffic system. In 2003, editorial writer Cornelia Grumman snagged the award for editorial writing. In 2005, Julia Keller won a Pulitzer for feature reporting on a tornado that struck Utica, Illinois. And, in 2008, an investigative reporting team including Patricia Callahan, Maurice Possley, Sam Roe, Ted Gregory, Michael Oneal, Evan Osnos and photojournalist Scott Strazzante won the Pulitzer for its series about faulty government regulation of defective toys, cribs and car seats. In March 2004, the Tribune announced that freelance reporter Uli Schmetzer, who retired from the Tribune in 2002 after 16 years as a foreign correspondent, had fabricated the name and occupation of a person he had quoted in a story. The paper terminated Schmetzer as a contract reporter and began a review of the 300 stories that Schmetzer had written over the prior three years. In May 2004, the Tribune revealed that freelance reporter Mark Falanga was unable to verify some facts that he inserted in a lifestyle-related column that ran on April 18, 2004, about an expensive lunch at a Chicago restaurant—namely, that the restaurant charged $15 for a bottle of water and $35 for a pasta entree. "Upon questioning, the freelance writer indicated the column was based on an amalgam of three restaurants and could not verify the prices," the paper noted. After the correction, the Tribune stopped using Falanga. In October 2004, Tribune editor Ann Marie Lipinski at the last minute spiked a story written for the paper's WomanNews section by freelance reporter Lisa Bertagnoli titled "You c_nt say that (or can you? )," about a noted vulgarism. The paper ordered every spare body to go to the Tribune's printing plant to pull already-printed WomanNews sections containing the story from the Wednesday, October 27, 2004, package of preprinted sections in the Tribune. In April 2009, 55 Tribune reporters and editors signed their names to an e-mail sent to Kern and managing editor Jane Hirt, questioning why the newspaper's marketing department had solicited subscribers' opinions on stories before they were published, and suggesting that the practice raised ethical questions as well as legal and competitive issues. Reporters declined to speak on the record to the Associated Press about their issues. "We'll let the e-mail speak for itself," reporter John Chase told the AP. In the wake of the controversy, Kern abruptly discontinued the effort, which he described as "a brief market research project." In September 2012, Tribune education reporter Joel Hood resigned from the paper to become a real estate broker, City Hall reporter Kristen Mack left the paper to become press secretary for Cook County Board President Toni Preckwinkle, and the Tribune hired Pulitzer Prize-winning photographer John J. Kim from the Chicago Sun-Times. On April 6, 2014, the Tribune increased the newsstand price of its Sunday/Thanksgiving Day paper by 50 percent to $2.99 for a single copy. The newsrack price increased $0.75, or 42.9%, to $2.50. By January 2017 the price increased again, up $1 or 40% at newsracks, to $3.50. At newsstands it went up also $1, or 33.3%, to $3.99. On January 28, 2015, metropolitan editor Peter Kendall was named managing editor, replacing Jane Hirt, who had resigned several months earlier. Colin McMahon was named associate editor. On February 18, 2016, the Tribune announced the retirement of editor Gerould Kern and the immediate promotion of the paper's editorial page editor, R. Bruce Dold, to be the Tribune's editor.